← What to expect when you’re expecting: more panic attacks. Ladies (and the three men that are obligated to read this by marriage or blood) — listen up! I am in desperate need of your help. You see, it’s May! [you nod in confused agreement]. What’s so special about May? You mean, you don’t know?? May is THE month I get pregnant. Every other year. May 2008 – after nearly a year of trying, May was the magic month. That year I shocked the hell out of surprised my husband on Father’s Day by making him breakfast and breaking the news (no, I’m not sure which shocked him more). May 2010 – armed with the confusion that it took nearly a year to conceive our first, we decided to let nature take its course when I stopped nursing just a few short weeks before. And a few short weeks later my 15 month old had the positive pregnancy test in his mouth (I was too shocked to grab it away after it dropped from my stunned hand). 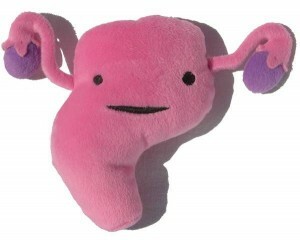 Come and play with me, I’m a harmless plush uterus! 1. I suffer from hyperemesis gravidarum. Which might just sound like the worst morning sickness ever, but in reality it involves vomiting that scares small children, hospital stays, IVs, threat of miscarriage and generally complete incapacitation. 2. We live in NYC and are not in the 1%. Which means the third child will have to sleep in the sink until it’s old enough to move out. 5. I finally get to sleep. What’s that? Those aren’t good enough reasons? The joys of motherhood far outweigh these minor details? 2. The first time I delivered I almost died, the second time I delivered was the most life-affirming moment I could imagine and now I’m curious what a third February due date would be like. 3. No periods for another two years. 4. Because I’m obsessed with baby names. 5. We have one kid that is my mini-me and another that is my husband’s clone. What would the in between mix look like? As you can see, I’m not fit to be a parent to the two I already have, so we can all agree a third is out. Right? If you enjoyed this post, please click on the juggling woman below. A click = a vote for me. How easy is that?? This entry was posted in Bad mom and tagged birth control, expanding family, help, Morning sickness, ovaries, Pregnancy. Bookmark the permalink. 13 Responses to Nevermind that noise, it’s just my ovaries whining. Um, I only have one so far and I already feel myself wanting three. And I REALLY want another one ASAP, but I keep telling myself that I can’t be pregnant when I come to NYC alone for BlogHer’12. Either way, I’m clearly no help. Yes! You should wait until after August! But otherwise you are in fact making me want another. Three is nice, right? You are really on the fence. When my daughter was around nine months and I had one of those pregnancy “scares,” as in I thought for a few freak hours that I could possibly be pregnant and even dished out money to buy a home pregnancy test, I pretty much knew that I was done. I have never changed my mind now six years later. When you know, you know. Ugh, I think you’re right. I am more on the fence than I would care to admit. Although having another makes NO sense on many levels. Damn hormones are getting the best of me! I feel you. Sonia is only 7 months, but she is getting to that awesome stage where I’m like, man I could really see having another one someday (read: not soon). Then, there’s the other side where I’m terrified that I’m going to get pregnant even though I have an IUD and a less than 1% chance of that happening. Babies. Once you have them, they consume your life. Even the ones you’ve yet to have or may never have consume your life. Oh, and like you, my next child (should he or she exist) will have to sleep in the sink because yeah. So not living in the 1% down here. Right? It’s so true. They consume your life. I am right there with ya. I have a beautiful little girl and baby boy. Isn’t that enough for me? I really can’t say if we will have a third, but I think about it a lot. I always thought I only wanted two and now I’m confused. I loved being pregnant. I loved giving birth. I also love SLEEP and the fact that after 5 years my breasts are finally mine again. We only have one tub and as a family I’d rather give up dishes than showering!! But it was a tough call. I’m hoping once the youngest reaches a certain age it gets better? After the third the response is ALWAYS HELL NO!! Shop is closed. I still don’t know if the third was the right decision…although he is adorable. Ah, now I get it! Hysterical!! And I’ve heard that before. It’s like me qualifying that if I had a third I would really need it to be a boy. Um, sorry, those kind of requests are not permitted. You have to commit 100%! From one fellow hg sufferer to another… I can relate to what you’re going through.